Let the market – your constituents – decide on broadband! 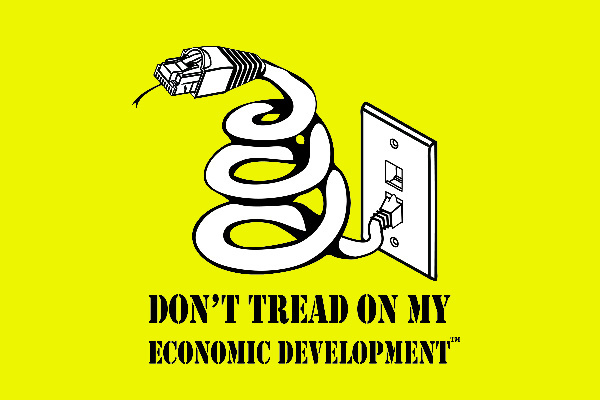 SB190 was supposed to codify a routine municipal accounting procedure designed to advance a local broadband decision by Utah communities, but instead it has been poisoned with an anti-free market amendment – Amendment 2. As champions of smaller government, shouldn’t you be rushing to kill Amendment 2, and proceeding with the bill as written when it passed committee? Macquarie Capital has come to Utah’s with over $100 billion in assets, much of which they want to invest in Utah communities to move broadband forward. This is a huge potential investment in Utah on which Amendment 2 of SB190 slams the door. How fiscally irresponsible is that? Broadband is one of the best economic engines that communities large and small can harness. Over 300 communities across the U.S. successfully own and operate broadband networks that are transforming their local economies. Rational people would expect Utah state legislators to welcome the opportunity to replicate these successes. Utah senators say they believe in the market. Well, the market is comprised of those individuals, local businesses and organizations in a city or county that pay for broadband, or pay the price for not having adequate broadband. When a market in Utah says it is not getting the broadband services it needs or wants, that market has spoken. When the duly elected local governments and their constituents decide that the community should own the network, in whatever partnership or other arrangement that best benefits them, that market has decided. If Utah senators oppose big government intrusion and believe in the market, then let the Utah markets choose what they believe is their best solutions and the best way to pay for those solutions. Let the markets decide. Please reject SB190. Click here to email the entire Senate body and voice your opposition! They need to hear from you. A month ago tomorrow the telco/cable lobbyist machine launched an unprecedented assault on communities’ ability to determine their broadband future by attacking the private sector. Twice! Luckily, community and national broadband activists unleashed a swift strike-pivot-strike counterattack that proved effective and seemingly successful. No one believes these battles are done, but broadband advocates feel communities are better prepared for future challenges that are sure to come from incumbents. It is wise to assess what was done in these last 30 days to beat the bills, but more importantly to look at incumbents’ changing behavior in the face of a changing competitive landscape in community broadband. Ignore the rhetoric that the public sector should not be spending taxpayer money to enter the broadband business. It’s a diversion to hide who’s really wasting tax dollars. The combine taxpayer dollars invested in all of the community nets don’t even begin to rival the tax dollars local and state governments have subsidized telcos and cablecos to deliver fiber broadband WE HAVE NOT SEEN (as described in this interview)! The real issue here is competition. Not unfair competition. Any competition is something to be destroyed, in the eyes of large incumbents. They are single-minded, relentless and ruthless in that pursuit. Think Mongo. In Kansas on January 27 and a couple weeks later in the Utah statehouse, three bills reared their ugly heads in a dramatic change in strategy that aligns with the real motive – a drive to nuke competition. State Legislators Becoming Weapons of Mass Obstruction Against Broadband Competition? An ALEC-inspired, lobbyist-written anti-municipal broadband bill introduced in the Kansas state legislature – Senate Bill 304 – is threatening all broadband in the state, even from private-sector challengers to existing incumbents. Dropping in seemingly from nowhere on January 27, the bill was tracked for swift near-silent passage.